A person’s age plays a big role in the risk of a cataract. By the age of 80, more than 50% of Americans have developed some degree of a cataract in one or both eyes. By age 95, that percentage jumps to almost 100%. Although it is rare, a cataract can also form in children and even new-born infants. No matter what your age, it’s beneficial to gain a basic understanding of what a cataract is, how to limit the risk of developing a cataract and what can be done if one does form. A cataract is an eye disease where the normally clear lens of the eye becomes cloudy. The lens of the eye is typically clear like a clean window. This allows light to pass through and provide a sharp image to the retina of the eye. A cataract causes light passing through the lens to become distorted and cast an imperfect image on the retina resulting in blurred vision. The extent of the impaired vision is related to the level of cloudiness in the lens. 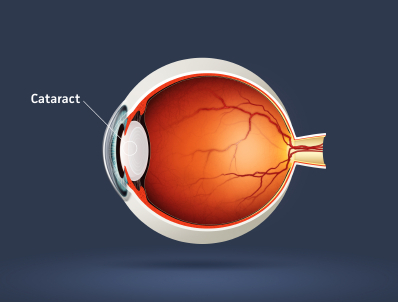 A cataract can develop in one eye or cataracts may affect both eyes. Cataracts are not contagious nor do they cause physical pain. There are many steps you can take to limit the risk of a cataract. Staying healthy, avoiding certain lifestyle habits and having regularly scheduled eye exams performed on your eyes are all at the top of the list. Research shows eating healthy and nutritious foods has a significant impact on your chances of developing a cataract. Studies published in the American Journal of Clinical Nutrition state a diet high in fruits and vegetables aids in the prevention of cataract development due to the high antioxidant content of these foods. Healthy diets and lifestyles also reduce the risk of developing health conditions which increase the chances of a cataract forming. Diabetes is one of the most notable health issues where the risks of cataracts are highly elevated. Smoking and the over consumption of alcohol may also increase the chances of cataracts. Studies show people who smoke a pack of cigarettes per day may double their risk of developing a cataract. To address the risk of radiation related cataracts, proper sunglasses should be worn outside by people of all ages (including children) to protect the eyes from UV exposure. Regular eye exams performed by an experienced eye care professional are also critical to reducing the risk of cataracts and limiting the impact on clear vision if a cataract does form. Cataracts won’t just ‘go away’. Some cataracts do stop progressing while others continue to grow and progress to the point where they will cause blindness if left untreated. Cataract surgery is currently the only remedy for removing a cataract. It is one of the most common types of eye surgery performed in the United States today. However, the need for surgery is usually not immediate. Cataracts may be properly managed with the use of corrective lenses and it may take many years before surgery is necessary. If a cataract does develop, it’s important to seek and follow the care and guidance of a qualified eye doctor to deal with a cataract and determine if our when cataract surgery is appropriate for you. To learn about a company and a team of eye care professionals that have been providing their patients with quality eye care and eye wear for more than 30 years, please visit www.shawneeoptical.com. We are bombarded with the latest and greatest diet plans to help us lose weight and look like a movie star. While it’s unrealistic for any one diet plan to fit the needs of everyone, many of these diet plans do focus on the importance of providing your body with healthy foods, rich in nutrients essential for your body to perform at optimal levels. Your eyes are no different. Clear vision and healthy eyes are reliant on proper nutrition. The next time you are in the grocery store or open the refrigerator door to “see” what looks good, ask yourself if that particular food is beneficial to your eye health and overall vision. It’s important to talk to your optometrist and discuss what foods you are eating and what foods you should be eating to promote good eye health and clear vision. It’s also beneficial to speak with your eye doctor about ingesting vitamins and minerals naturally by eating foods rich in eye-healthy nutrients or whether a vitamin or mineral supplement is appropriate for your particular needs. To learn more about quality eye care and eye wear at all stages in your life, please visit http://www.shawneeoptical.com.